Remote work becomes more and more popular with each year, encompassing ever more professions that don’t require workers to be at the office to perform their duties. 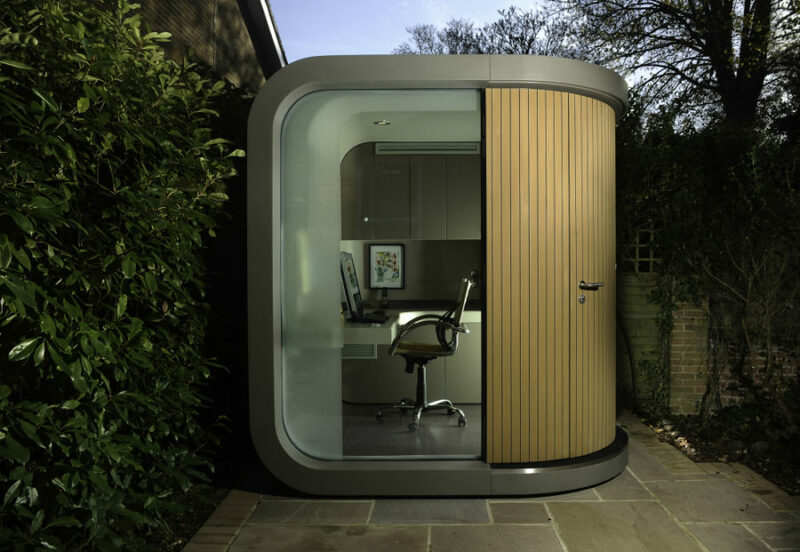 And so does the rise of home office pods that you can plonk inside your garden, and enjoy working in peace and quiet. 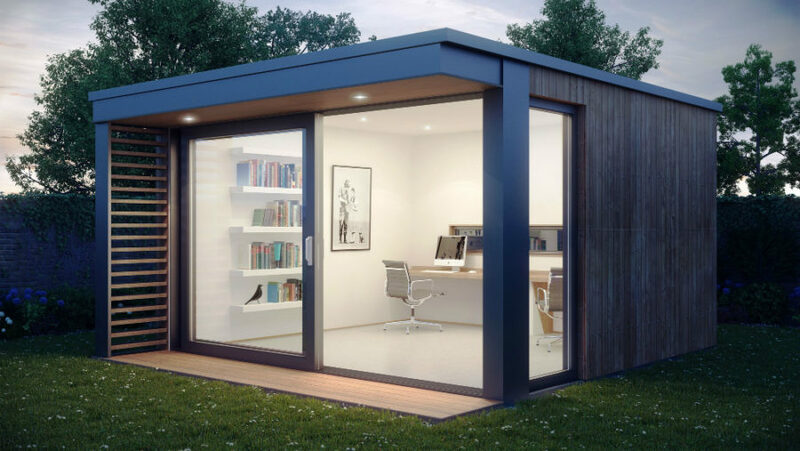 As far as modern outdoor home office sheds go, you can now choose from a wide assortment of cubicles that you wouldn’t want to leave. 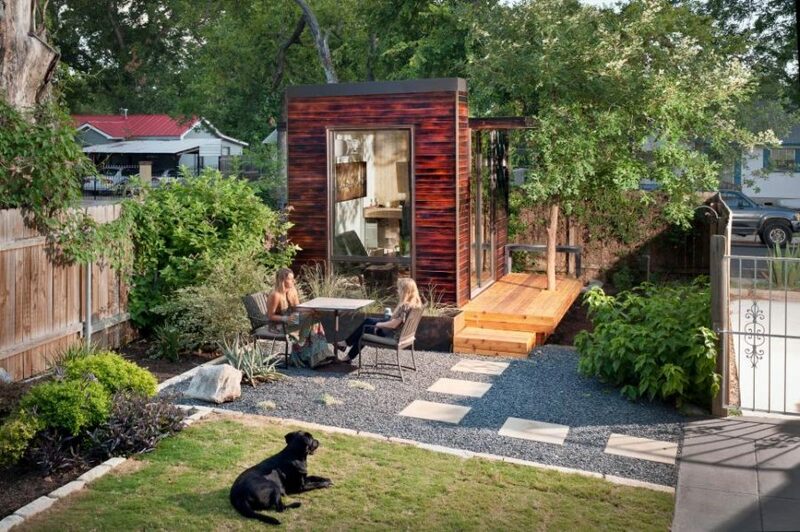 Looking like tiny little homes, garden office pods are self-sufficient productive spaces, where you can not only make a living but also create, think, and ponder. 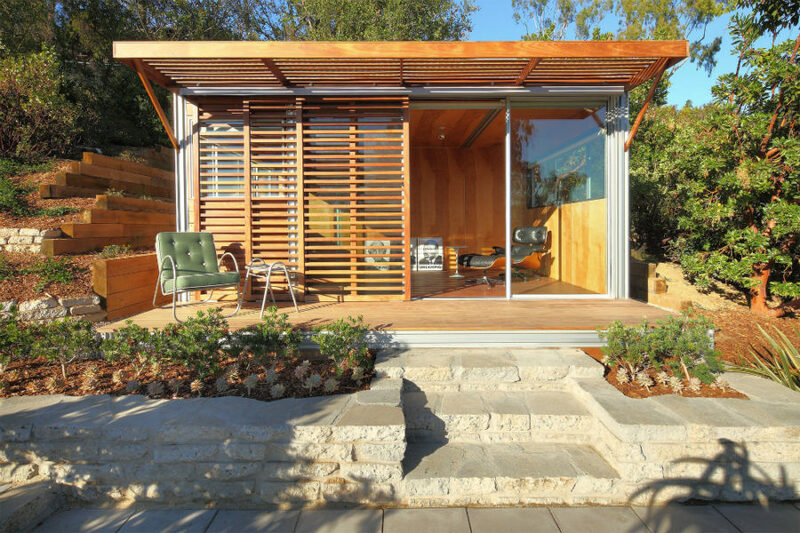 Sett Studio designed such a backyard office to not only be stylish but also energy efficient thanks to Structurally Insulated Panels (SIPs). A tall window provides views of the garden, while the solid wall street fences off the busy street. The beauty of having your own working studio is, obviously, that it eliminates commute. But it’s not only saved time you gain. 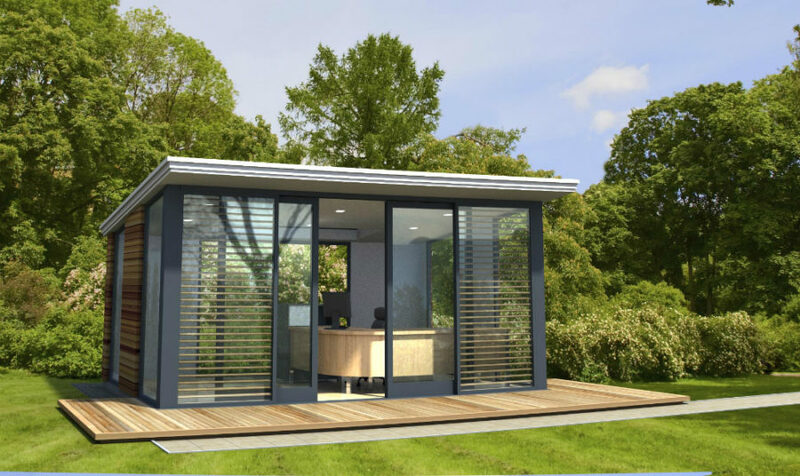 You can also order a garden office pod design that will accommodate your every need like additional space for meeting with clients or a separate room for resting. This pod was designed for a professional photographer to remove distractions as well as provide some space to receive clients and do small shoots. 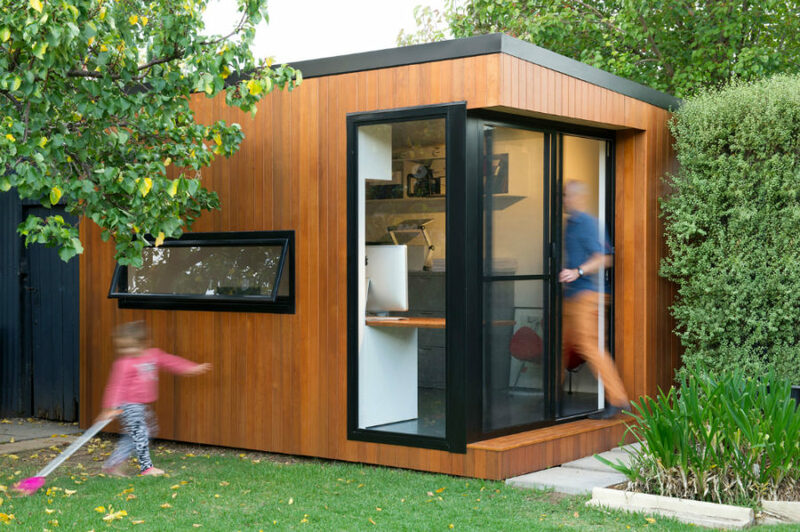 Backyard Room decided to combine functionality and natural aesthetic in this tiny office shed project. It is not only surrounded with greenery, it is planted with it, which creates an intimate and fairy tale-like retreat. Small pod is enough to house a desk and a couple of chairs. Outside, there is an adjoining terrace and a bench for productivity-raising breaks and post-lunch naps. A long narrow garden isn’t a problem for a custom design. 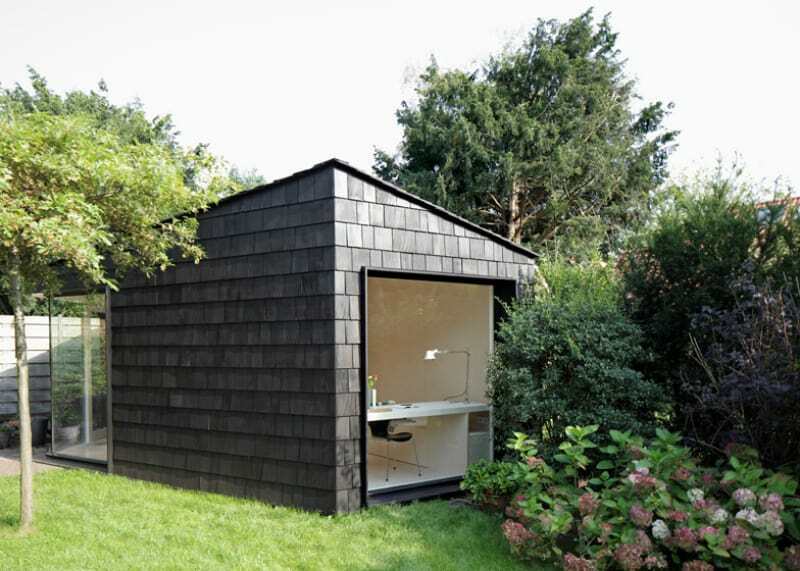 Garden Studio in Bussum is a narrow unit that acts as a study, a guest house, and a storage place. Aside from fitting perfectly into the allocated space, the studio has a design that corresponds with the neighbouring buildings, but not without a modern touch. Although their price can reach up to $30,000, the office pods may well be worth it as a temporary (or permanent) office space or studio for your business. It doesn’t have to be big. 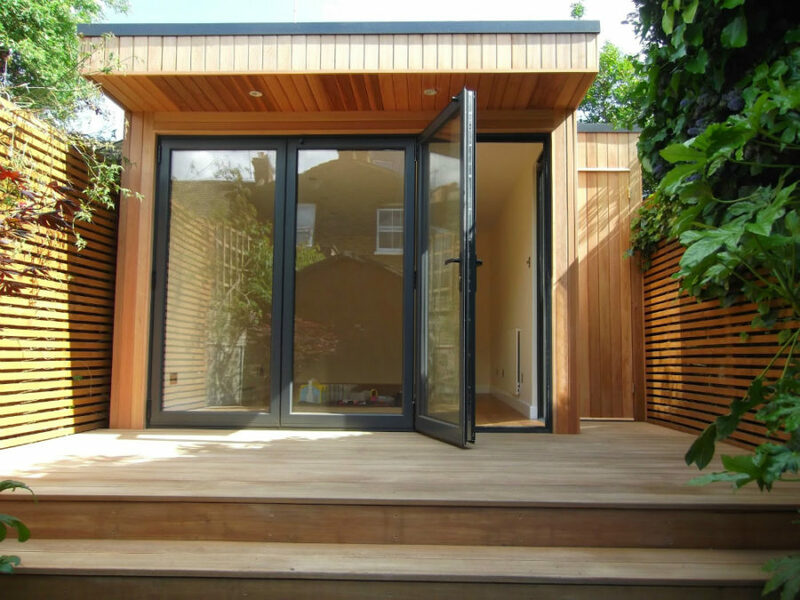 This small office shed was built for a chartered structural engineer, and reportedly paid off. 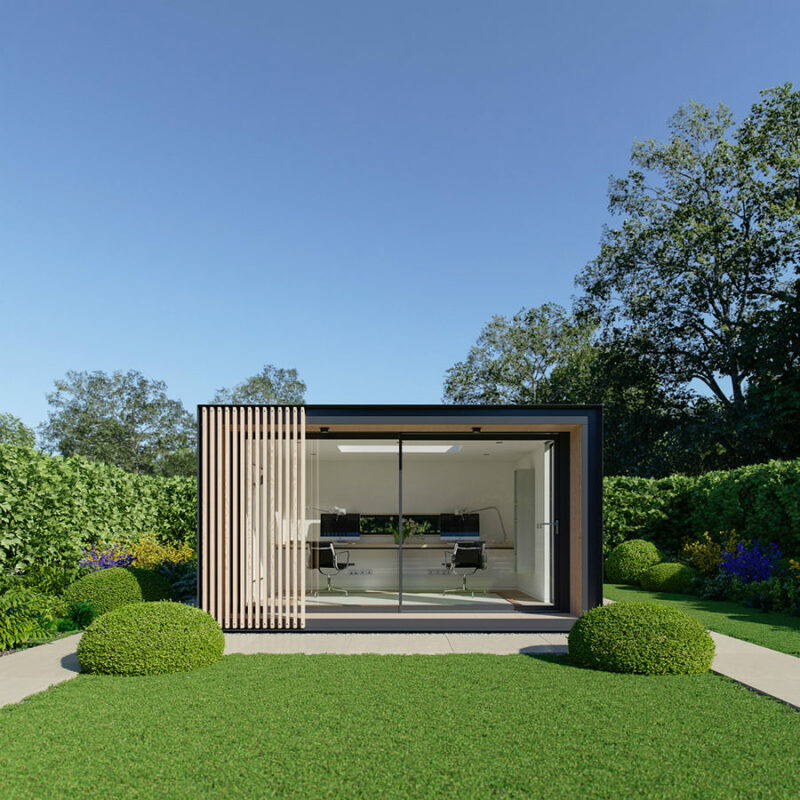 Modern outdoor home office sheds market has grown so much that you don’t need to buy prefabricated catalogue models. You can have your own design built by professionals, who specialize in construction and carpentry like Paul Winters of Office in My Garden. Winters offers custom design as well as a portfolio rich in different types of units combining modern design and practical sensibilities. Wooden plank siding is the most attractive thing in the world. And it seems like office pod manufacturers know it better than anyone. Even the most modern office will look inviting and stylish with this type of siding. 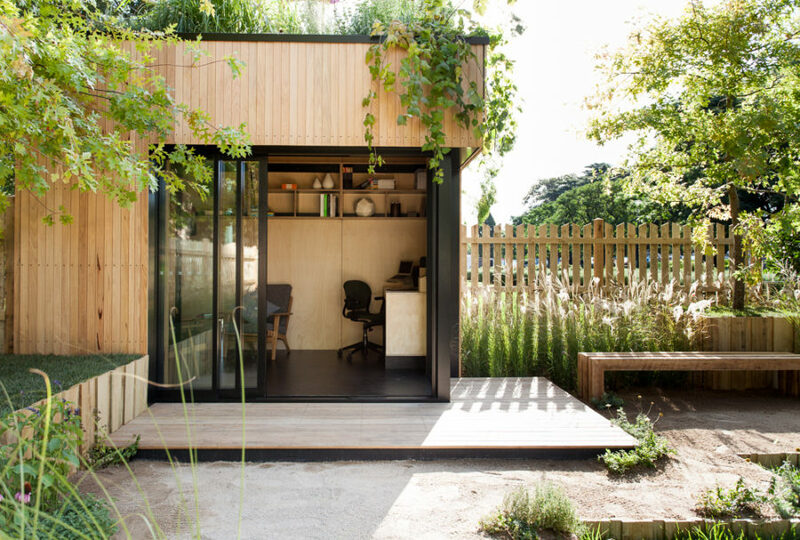 Just look at this Green Studios garden office pod. These are also easier to fit with more traditional or simply older modern architecture. 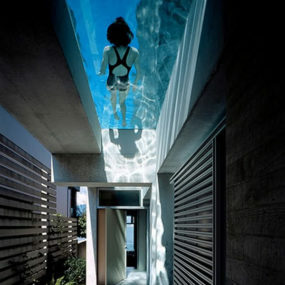 Sleekness and simplicity of such design works wonders in any style. Bold glass inclusions like in this office-yoga studio by Neil Dusheiko bring contemporaneity to simple wooden structures. 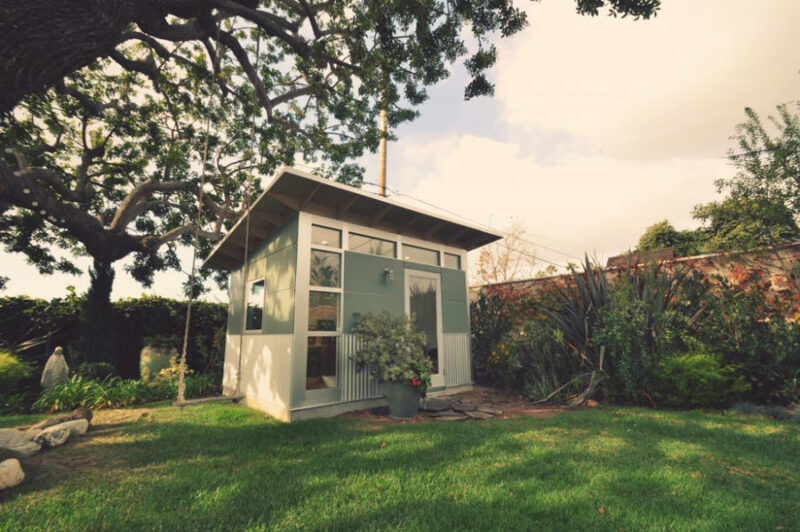 A garden office shed can be repurposed for storage and additional needs like a workout room or a guest house. A professional photographer, Ben Rice commissioned Green Studios to build him a garden room, where he could keep his kit as well as work. Ample space within the structure further provides multiple changeable options. 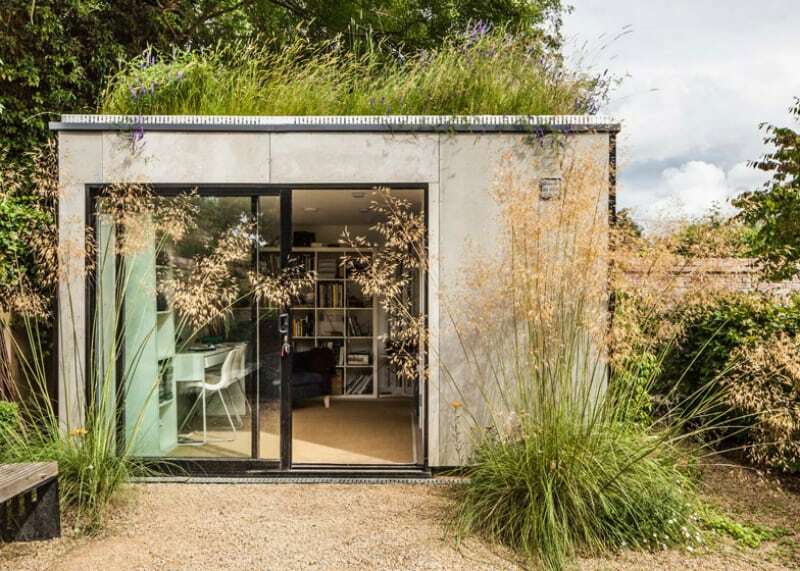 At the very least your garden office can double as a roof garden. It’s not purely decorative, mind you, a green roof is a great way to insulate a pod that stands in a sunny spot. Surrounding yourself with greenery is a good way to create a perfect creativity-inducing retreat as well. 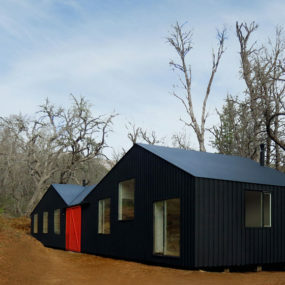 Australian magazine called Inoutside designed an entire collection of modern outdoor home office sheds. You can see a glimpse of what’s on offer in this Cooba unit. Enclosed in wooden plank siding, the office looks stylish and modern with its modest black steel-framed windows and glazed doors. Peter Guthrie imagined a clean contemporary modern office in the garden without any unnecessary details or elements. Just the walls, the roof, and some natural light. We like the simplicity of the project that focuses on work and eliminates distractions. There is just a thin glass transom for resting your eyes without needing to get up every fifteen minutes. Another project from Pod Space is Micro Max Pod that flies under $20,000 mark. 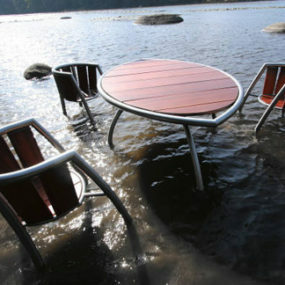 Although small, it offers a feature you wouldn’t find even in the most comfy office – underfloor heating. Ever dreamed of working without your shoes on? The rest of the bill includes a full height window and a glazed door, Siberian larch cladding, and white micro-porous paint interior. 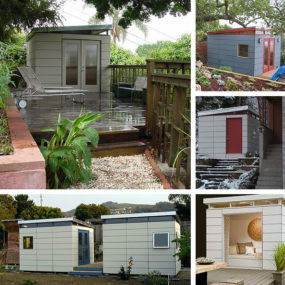 Many of the modern outdoor home office sheds remind us of those trendy tiny houses. Seriously, it looks like one could live in these offices. KitHaus specialize in small homes, but some of their sheds would make perfect garden offices like this one from K4 Series. Turns out tiny structures are more versatile than they look. 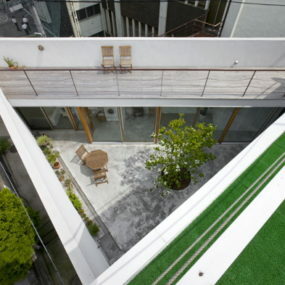 BLOOT Architecture combine living space with a home office, and they did it under permit-free construction limits. The result is a brick cube-like structure with a timber facade and a louvre system that provides more privacy for the guests, and eliminates visual distractions for the working residents. 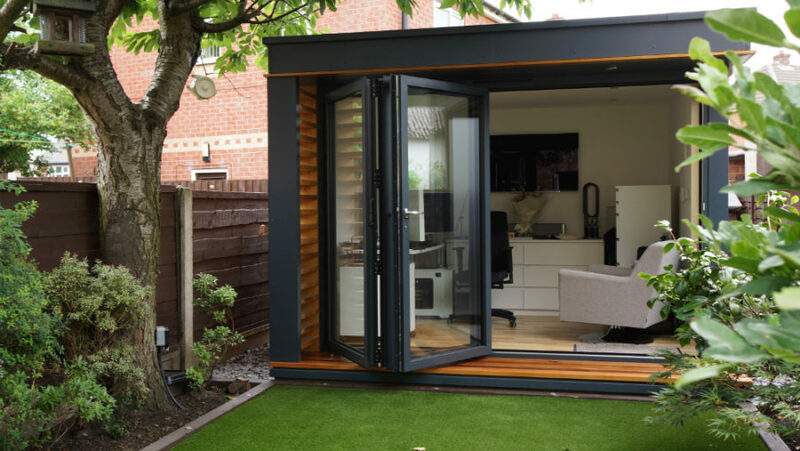 Cube Life offer their expertise in garden building along with modern home office model designs that are so good, you could hold meetings in them. 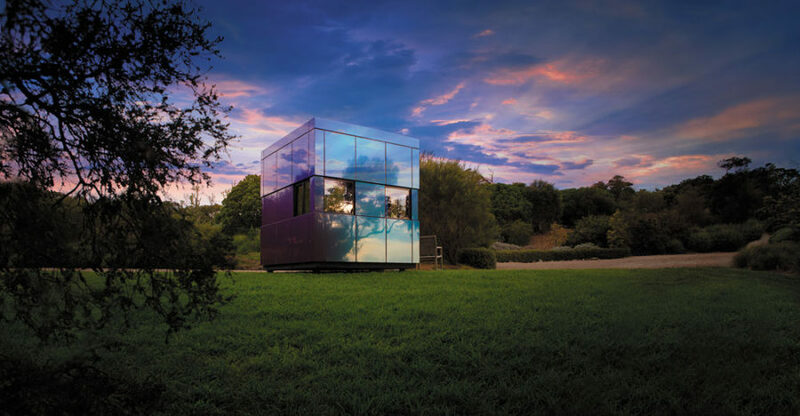 This particular shed is like no other, as it features glass walls all around, but when you need to shut out all the distractions, a louvre system is there to provide comfort. 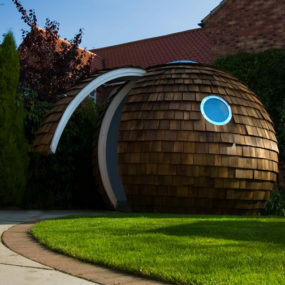 Another one of Pod Space designs was conceived by George Nijland. 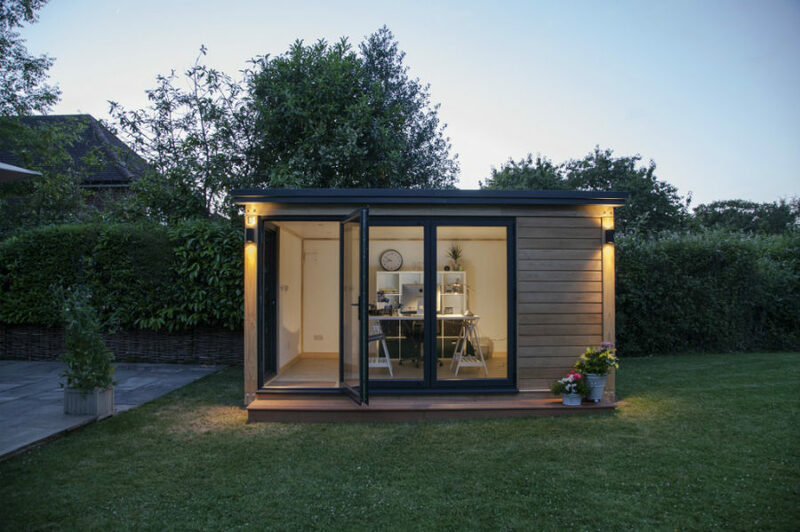 It’s difficult to find a more contemporary, sophisticated, and stylish garden office shed. A small louvre system looks more decorative than practical, but you’ll never lack natural light with that generous skylight in the middle of the pod’s ceiling. 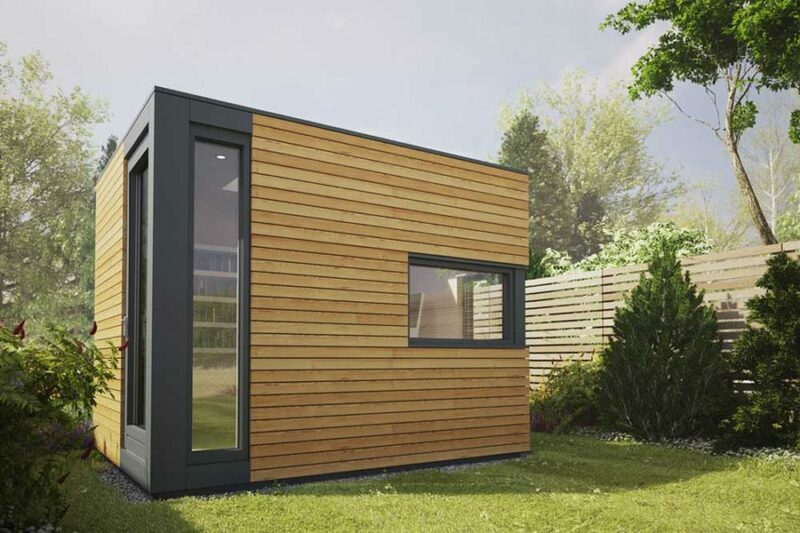 If wood doesn’t suit your new contemporary house, then perhaps a design from Studio Shed’s Signature Series would make a fitting addition to your yard? Made of Zip System weatherproof wall panels and corrugated Galvalume roofing, these sheds are built to last a lifetime, or at least that’s what the firm promises. Want your office to have a futuristic or space ship-like aesthetic? OfficePOD is the perfect candidate, as it looks like a small ship’s cabin, designed just for work. 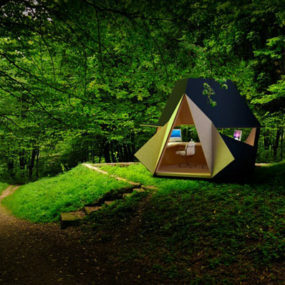 The POD was designed to eliminate distractions so expect decent soundproofing and sleek interior design. Harwyn is, too, an extraordinary office pod that challenges the rules of garden offices themselves. 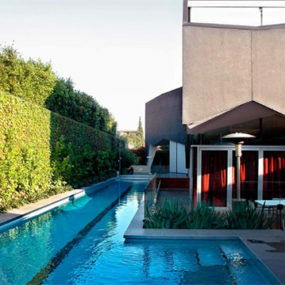 Its sleek and minimal design is more contemporary than modern. Built with a double-layer protective system, the Harwyn cubicle is weatherproof, but you can add features like remote control blinds, a heating panel, and many others when choosing your design. 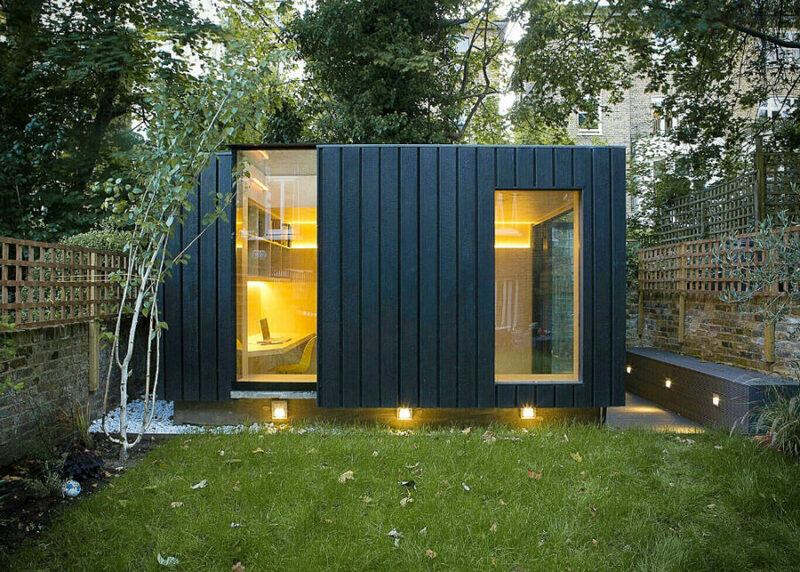 Combining shed and office in more than just the name, Platform 5 Architects created something more than your run-of-the-mill garden office for a 1950’s terraced house in St. John’s Wood, London. Its curvilinear shape, that was intended to fit organically with the natural environment, creates pockets of space for work and rest, and bears a cool retro futuristic aesthetic. There is nothing quite like working in a peaceful green garden within a few feet of your own home. 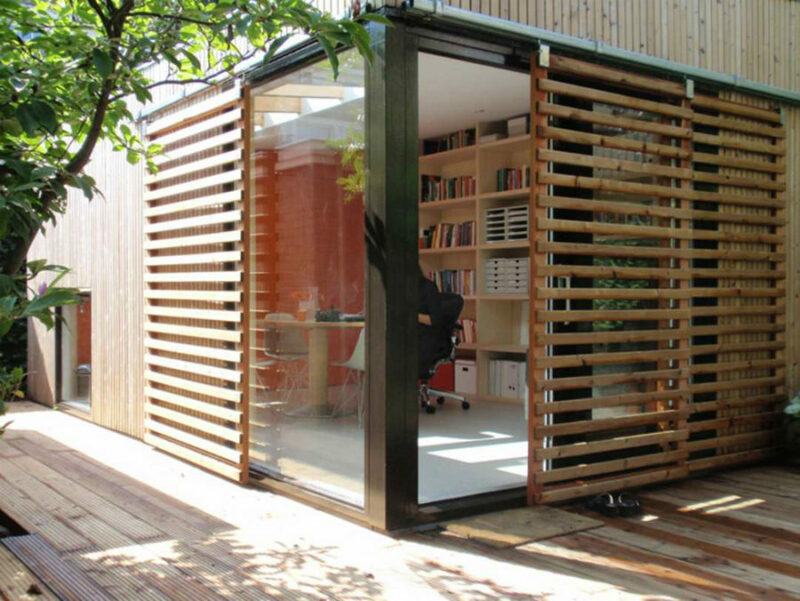 Modern outdoor home office sheds allow that separation to be as convenient and painless as possible.